Just over a week ago I came across a blog, started by a Jesuit novice to recount his pilgrimage experience. More recently, he wrote daily posts as he prepared for his first vows, which he made last Saturday. Last Friday's post was about the crucifix presented to each Jesuit as he makes vows, and which will accompany him for the rest of his life. Reading this reflection led me to ponder on the things RSCJ receive at different stages of incorporation and commitment. Often there is something to wear: a Society emblem, or our medal at the beginning, and at final profession, a ring and cross; visible signs and symbols of our belonging and of our vowed commitment. We receive the Constitutions when we enter the novitiate and embark upon an intense study of them, and re-receive them at first vows, that they may be our spirit and guiding light. And we also receive a crucifix at first vows. This lives in our bedrooms, maybe in a prayer space or hanging on a wall. Many older sisters still keep to the tradition of placing their crucifix on their bed each morning: a brief reminder, a way of "touching base", at the beginning and end of each day, with the One to whom they have pledged their lives, for Whom they will live - or have spent - that day. Gracious and loving God, we who accept your covenant of love must be ready, as Jesus was, to lay down our lives for love. We find in Him whose Heart was pierced, the example and strength to respond in total love. Bless this cross, saving God, that it may be for Silvana a constant reminder of the price that must be paid for love. May she grow in the image of your Son, surrendering herself joyfully to you as he did. And that's when I knew which crucifix I wanted to receive. 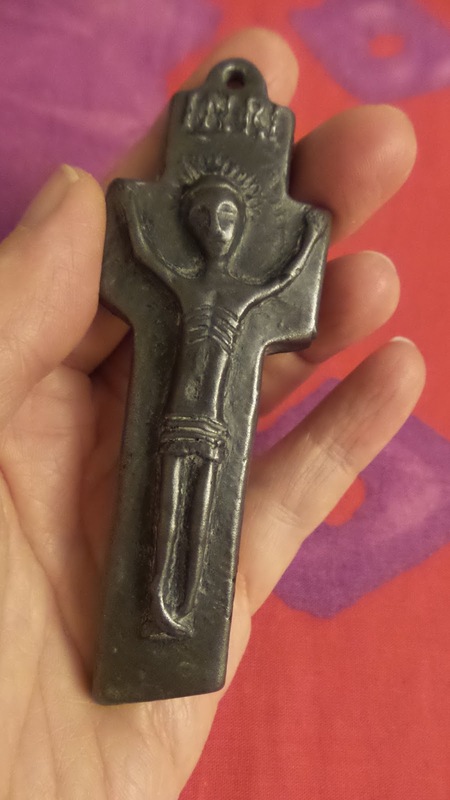 I'd seen it on sale several weeks before, in a Celtic shop: a replica of an Irish penal cross, small and compact enough to be easily hidden by people who, in the face of savage persecution, knew only too well what it meant to pay the price for love. And that is what my crucifix has been for me: an unprepossessing, somewhat stark but constant reminder of the price of love, whether paid in persecution or in generous sacrifice; and a reminder, too, of my vocation as an RSCJ, to give my life for love, often in ordinary, unappealing, quotidian ways.